This isn’t swamp sludge! I promise. Close friends and family know, without a doubt, that I am always talking about some new or even strange food or supplement that I just learned about. Especially my husband. He is such a good sport and his health benefits from it. I love that he will try the seemingly crazy things with me. A little over a year ago that ‘new’ thing was chlorella. I want to and choose to live a life where my body feels fresh, young and busting with energy each day. I know that this is possible because I’ve experienced it! A life where I rarely get sick and one that keeps my future self healthy too. A future self that doesn’t have major illnesses or depend on living day to day with 10 prescription medications. Prescriptions that have the same side effects as the things they are supposed to cure. I like to think of it as investing in my health savings account. I’ve read and believe that when we crave something it’s our body communicating a vitamin or mineral need, one that we may even be deficient in. In the past, when experiencing a craving, I would just eat something we had on hand and not necessarily think about the root cause of what my body needed. Ever since reading about this concept I try to be mindful about my food choice. In the summertime I remember craving salty and sweet and eating half a cantaloupe and it was like the best thing I had ever eaten. It satisfied the craving and the hunger and was rich with vitamins and minerals. One of the best ways to get minerals is through our leafy greens (kale, spinach, collards, etc) and algae (spirulina and chlorella). Sometimes I go for absorption through food and other times through supplements. Supplements like chlorella. I’ve tried chlorella a few ways: in ‘green’ powders, pills, and just regular old chlorella powder or granules. Pills are easy, you just swallow them with your meal and hopefully absorb most or all of the benefits. Powders can be mixed into your smoothies, puddings, oatmeal, soup, and more and have a higher absorbency than pills. The thing about powders is the quality varies. A few weeks ago I bought some NOW chlorella powder, thinking it would be like spirulina (mostly tasteless), but found that it had a certain odor and taste. A taste, I lovingly refer to as ‘horse hay’. Vibrant Health’s Green Vibrance powder was my first experience with a ‘horse hay’ powder. It had the worst smell and hard to hide taste BUT it was so chock full of awesome ingredients that made me feel good and kept me feeling good that I stayed the course and finished the bottle. If you get a chance to read the reviews, do, they are great. Vegans and Veg heads highly recommend it. My second experience with a green powder was Spirulina. The first brand Nutrex and the second I don’t remember, but they were both great and were much better on the senses. Lastly, we have Sun Chlorella. My most recent find. After mentioning the dreaded, but still consumed, ‘horse hay’ chlorella products on twitter two weeks ago, Sun Chlorella graciously reached out and offered to send me a sample pack. Okay! Twist my arm! Boy did I feel lucky to get to try something NEW to me. I’ve heard it’s a high quality product, but haven’t tried it myself. So far I’ve had the pills and the granules. The pills or tabs I just take with water and a meal. The granules, I take a little bit of water in my mouth and add about half the granules, then a second time to finish the packet. The flavor was really good and overall, unnoticeable. Which brings us to the oatmeal…. 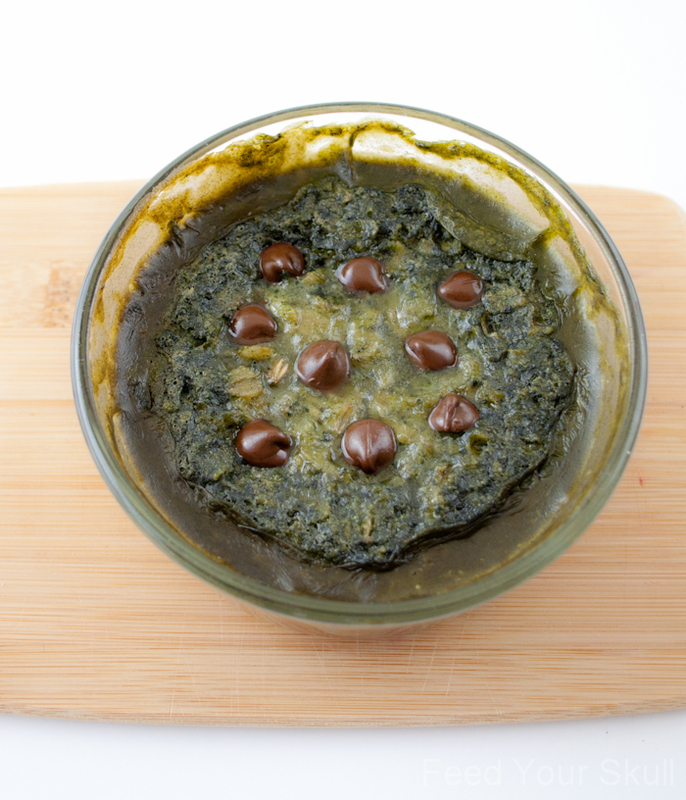 Thin mint…chocolate….green…chlorella oatmeal. I know the adventurous you’s will love it! For those that might not want the chlorella, I’ve offered a substitute. First add in oats, chlorella powder, and chocolate chips. Stir it up. Next add the almond milk, peppermint flavor, vanilla extract, and maple syrup. Mix well. First add in oats, and cacao powder. Stir it up. Have you tried chlorella or spirulina and if so how do you use it?? OKAY…I should preface by saying that I love YOU, I love you SINCERELY….but I almost choked when I saw the first photo…BLECH. It is fascinating what I’m learning from you and your adventurous experiments and I too one day will say that I am fully CLEAN, feeling great, etc….but WOW, that first photo….ha….that is all. Cheers to progress! I’m so happy that sounds good to you too, haha. Sometimes I feel so alone with the weird concoctions I like 🙂 I love spirulina! Thanks for sharing your link, I’ll have to check those out. 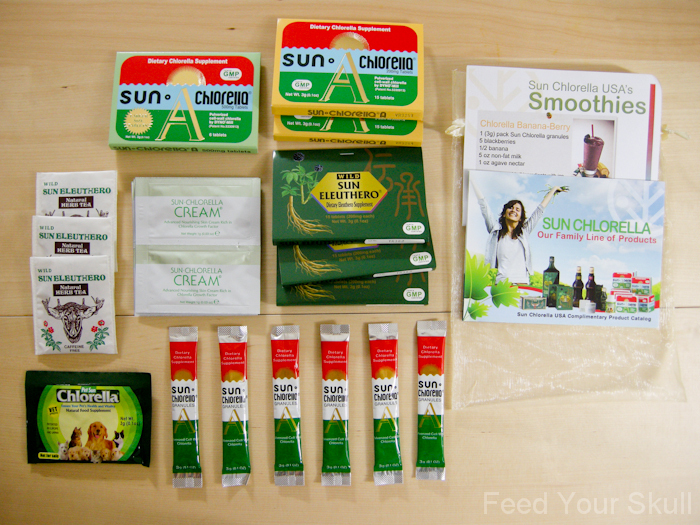 Pingback: A Sun Chlorella Giveaway!